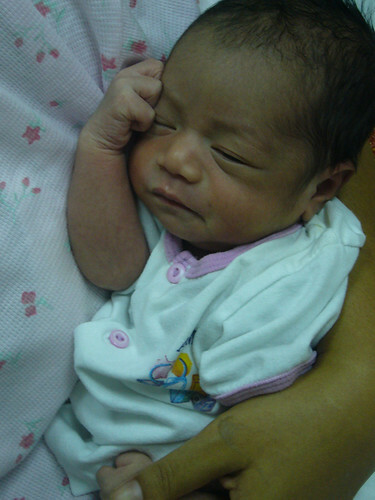 Our son Imaan, was born via caesarean section as he was way past his due date. This was in 2006. He was a healthy baby and didn't give us any problems at all. We didn't see anything wrong with the fact that he had a high threshold for pain. For example, he didn't even cry out when he took his vaccination shots while other kids were screaming. In fact, I was quite proud that I have a strong boy. Initially, he looked like he was developing normally and had started to babble and we did not see any problems. My mum did point out that he had a problem with eye contact but I didn't really pay attention. We first started worrying when he was still crawling when other kids his own age were walking. We also noticed that he used to look at far-away things from the corner of his eyes and slightly tilting his head. 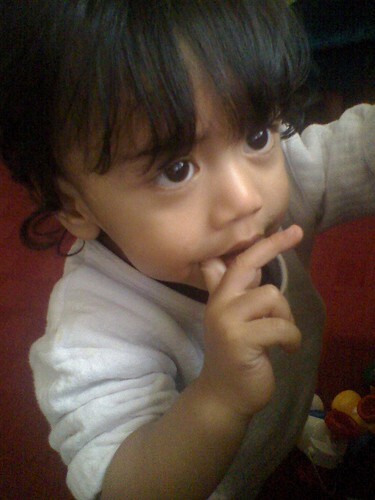 When he was around one years old, we took him to the eye specialist who told us that he was too young to diagnose. His eyes seemed to be fine but he wasn't paying attention to what the optometrist had in her hands. Our health visitor arranged for us to see a specialist to see our son. He did eventually walk at round 18 months and I guess we were relieved even though we had some concern at the back of our mind. We had our fears but kept it from each other - I guess we were in denial. Around that time, we started sending him to a day care centre. It was when the staff alerted us about his social problems when we decided to do something about it. One of the things that alerted them was when they had a fire drill and other kids were quite agitated but he continued with what he was doing as if nothing had happened. Imaan also has picked certain odd habits like spinning objects and would always walk on tiptoes. He also seemed to be in his world and would not respond when we called his names. Though we did not realise it (or was in denial), he had gone silent and no longer babbled. He used to love "Old McDonald had a farm" and we would sing out "Old McDonald had a farm "and he would finish it off with "eeya eeya oh!" That stopped. We took him to our GP and confided our fears. The doctor thought our son was OK and told us that we were worried for nothing but he did sign our son up for an appointment with a specialist. Around a year passed after that and our son was running around but his communication skills were very limited. He was around 2 then. We finally got appointments with two doctors. The first was at the general hospital where the doctor did point out that our son had some problems but he wanted to do further tests including a MRI scan of his brain. We were not really happy with the prospect. Anyway, we saw the second doctor - a lady. We were really happy with the way she talked to us that we decided that we would go with her instead of the other doctor and got her to cancel the MRI scan as well. However, our son had to undergo a battery of tests including two painful blood test, audiology test and sight test. We found out that there was nothing wrong with his hearing or sight and he didn't have any genetic abnormalities either. Following that he underwent a full nursery assessment at the Child Development Unit at a hospital here. Shortly after that we received the final assessment from the hospital. Even though we already knew, when we finally received the diagnosis that said that out son "fulfil the criteria of autistic spectrum disorder", it was quite hard to receive the fact in black and white. On the bright side it did mention that he had good cognitive skills. Along with this diagnosis came devastation. We knew that we needed to learn as much as possible about Autism to help Imaan. We searched the internet and read many books and research papers, night after night, month after month. Through our research we found out about the Son-rise programme and met other Son-rise parents who have been doing the programme with amazing results. With time, we have learned more about the programme and Autism and we realised that Imaan has no limitations. We took part in our first Son-rise course at the end of January 2010 and the second course in June 2010. We have now been provided with all the tools, knowledge and motivation we need to run our own home-based son-rise programme tailored to Imaan's needs. We are much more understanding, accepting, loving and patient. More importantly, we have learned to embrace Imaan and to appreciate all the little things that he can do. Every look, touch, sound, smile and laughter is so precious and beautiful. Autism does not have to be a life sentence for Imaan and all other children challenged by Autism. Rahil, Imaan's sister and we, Imaan's parents, love him so deeply and we can truly and honestly say that Son-rise programme is already changing Imaan and our lives for the better. This blog will be a record of our journey together. In case you are wondering "Why Imaan.biz?"